Foreclosure activity continues to slow. According to RealtyTrac, a national foreclosure-tracking firm, the number of foreclosure filings nationwide fell 35 percent as compared to July 2010, a statistic suggesting that the housing market continues to improve. “Foreclosure filing” is a catch-all term encompassing default notices, scheduled auctions, and bank repossessions. Filings fell to a 44-month low in July 2011. For all the improvement, though, activity remains concentrated in just a few states. More than half of all bank repossessions last month occurred in just a handful of states. 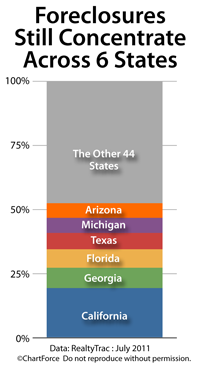 In July, 6 states accounted for 52% of activity. At the other end of the spectrum is Vermont. With just 11 repossessions for all of July, Vermont accounted for 0.016% of repossessions nationwide. Distressed homes are in high demand with today’s home buyers. According to the National Association of REALTORS®, they account for 30% of all home resales. That’s no surprise, either. Distressed homes typically sell at 20 percent discounts as compared to non-distressed ones. But, if buying a foreclosure is in your agenda, be sure to do your homework. Buying bank-owned homes is different from buying from “people”. The contracts are different, the negotiations are different, and the homes are sometimes sold with defects. If you plan to purchase a foreclosure in Corpus Christi , therefore, be sure to speak with a licensed real estate agent first. There’s plenty of available information online but when it’s time to buy, have an experienced agent on your side.